Energy Events Centre, Rotorua - RotoruaMatariki Glow Show! It’s literally legendary? 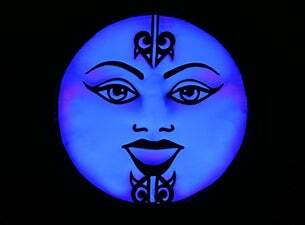 A giant scale puppet show for 5-9 year olds with magical glow-in-the-dark characters from Maori myth and legend. This innovative, cutting edge new concept features glow-in-the-dark puppets under ultraviolet light in a black box theatre environment. Rich in Te Reo Maori and Maori culture it’s an upbeat show that has the audience buzzing from the onset. This masterful 40-minute show is underpinned by catchy music that engages the audience immediately, followed by a Q&A session afterwards for our tamariki. There’s an abundance of educational content to take back to the classroom as well as a free storybook handed out to every child. The show is a delightful story of te kahui whetu o Matariki (the star cluster/sisters of Matariki) as they prepare for Te Tau Hou (Maori New Year) and the journey of the smallest star, Waipuna-a-Rangi. The show has been an absolute hit – the 2018 Matariki Glow Show toured from the Far North to South Auckland and attracted 12,000+ school children to 60 show at 10 venues with many shows sold out.